8.12 points at 58 votes (rank 61). Rombach 10 September 1984 - "Crème de la Crème"
Gamebase64 10 12th June 2005 - "A Classic!" Lode Runner is an outstanding platform game, where gold treasures need to be collected in 150 levels. Up to 5 enemies try to make it hard for you. You can run, use the ladders, climb along the bars and collect treasures. As soon as you have collected all the boxes, a melody rings and up until now invisible ladders can appear. If you have reached the most upper line of the screen, you will get into the next level. When you have finished all 150 levels, the game starts again with raised speed. You cannot jump, but you carry a weapon with you, with which you can dissolve the bricks for a certain time. No matter how far you will fall, you cannot get hurt. There is no time limit but the guards which reappear after their death keep you busy. The game engine is astonishingly fluent, so you can e.g. press the joystick right and up and your man will walk to the right until it reaches a ladder and will then head up without any additional joystick movement. Another feature is the game editor, with which you can format an empty disk with the the Lode Runner format and save up to 150 self-made levels. You can copy or move whole levels, and the professional version even allows you to create levels with automatic gamesets. The game shows a typical side platform view on one screen. Every screen consists of a black background, red stones and walls (in gamesets of other parties different colours as e.g. blue or green is used), white ladders and poles and mint coloured guards. Your man and the guards are the only animated parts in every screen, so the atmosphere is calm. There is no background music, which adds to the calm atmosphere. Selective sound effects can be heard when collecting treasures, creating traps in the walls, while falling, when all treasures have been collected and the level can be exited and when you lose a life. The game can be controlled by the joystick in port 2. The man is moved by pressing the joystick in the corresponding direction. By pressing left/right + fire the field left or right of the man is dissolved and a hole appears. Sledgie: "One of my favourite games of this genre. The motivation lasts for a long time, but requires good nerves, as some levels can infuriate the player." Jammet: "Loderunner forms a queue with the burners such as Boulder Dash, Tetris and others through its simple game principle as typical for retro classics, without losing air by being poorly coloured or having a meagre sound. Many have copied it -- this is the original. It's just fun!" Worf: "A novum was in these days the circular scrolling with which the levels could be faded in and out like in a movie. Unfortunately this was a bit slow, so with foresight it could be switched off. Fascinating in Lode Runner is the own physics, whose borders you can fathom. As in Boulder Dash there are various tricks, with which seemingly insolvable situations can be mastered. Also you can get creative yourself and build your own levels. Lode Runner is one of my absolute favourite games, even more than Boulder Dash, Archon and Elite." 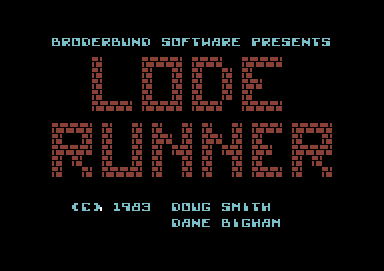 Jodigi: "Altogether this is a nice and good time filler, whereas nowadays there are better realisations of Lode Runner. Admittedly, the C64 version has its charme." Shakermaker303: "Ok, the game has its charme, but I cannot vote it as a great highlight. For me there are better platformers. I give the runner 7 out of 10 points." The Heist: "At first I got to know the VC-20 version of the game and somehow I still like it more, as the possibilities of this machine seems to be used much better and the game play is more fluent. In the VC-20 version (16K cartridge game) there is a convenient level editor integrated, which was a novum at that time and which had been implemented very well. You could save on disk as well as on cassette. If I remember right, the levels needed 3 blocks of space on the disk and I still own about 20 self-created levels. Timeless game principle, 8 out of 10 points." Mysticus: "The game is one of my favourite ones. Unfortunately, it contains a bug, because after 255 levels the level counter overwinds to level 000. Then it starts again with level 001. Furthermore, the information about the two difficulty stages is not correct. It is an endless game. In the third run, however, there is no coming further than level 357 (101), as you are standing in the non-dissolvable area at the lower left, and the enemies are too fast for you to escape. That's a pity, but there are probably not many players who will reach the speed level 3, alone due to time reasons. It took me 7 days to play to level 357. In the datasette version level 65 is the last, as the enemies fall too fast, so you cannot reach the critical right area. When having 17 levels this is level 14 in speed stage 4. Crystal clear 10 points for the conversion and the continuous fun." 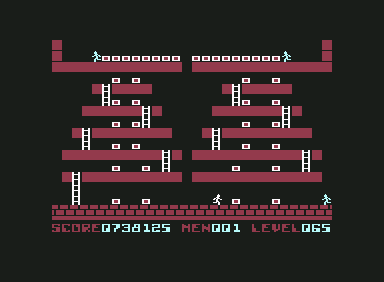 Lode Runner (datasette version) an excerpt of 16 levels from the disk version. The execution speed is a bit slower. With the game editor sets of 16 levels can be saved. The different title screen and different keys for the functions need to be mentioned. 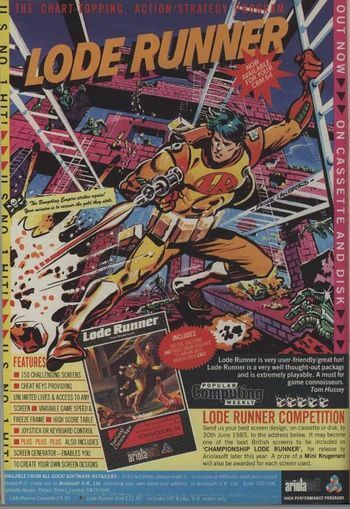 Lode Runner II (disk version) is an almost 1:1 copy of Lode Runner, but with 104 completely new levels (from an unknown source, probably a fan edit). The colour of the bricks was changed from red to blue. Take note that there is also a defect image of this version on the internet, with only 21 playable levels - the levels 22 upwards were overwritten with other data. 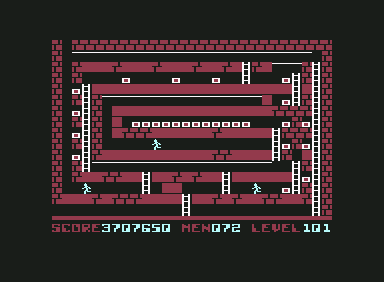 Lode Runner IV (disk version) also a fan edit, with bright green bricks. From the 127 levels only 32 are new, the other 95 are copies from Lode Runner II, partially in a different order. Lode Runner V (disk version) another fan edit, with blue bricks. From the 107 levels even only 14 are new, the other are copies (partially from Lode Runner II and IV). Championship Lode Runner a very difficult set of 50 levels, which need more than to be able to play through the 150 levels of the original version in one week. 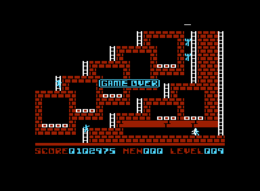 Professional Lode Runner is a special version of the Lode Runner 1 disk version, with which you can create an own executable game set. 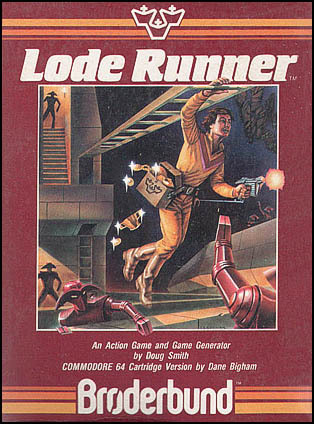 Lode Runner has been preserved in almost all versions for the C64. Note: This version is not considered in the Highscoremaster-table! Lode Runner in the Killer List Of Videogames. This page was last modified on 15 January 2019, at 17:22.